The final starburst of Illuminating India was the evening concert with Yorkston/Thorne/Khan opening for Talvin Singh. Held between 4 October 2017 and 22 April 2018 at the Science Museum, Illuminating India commemorated 70 years of Independence and was part of the British Council’s UK/India Year of Culture. It took place in the Science Museum’s IMAX theatre. For those unsure about negotiating acronyms and trade names, IMAX is a widescreen cinematography technique. It allows images to be shown maybe ten times bigger than on standard cinema screens. Both acts took advantage of its multimedia potential. In truth, if the venue had been the Natural History Museum, also on South Kensington’s Exhibition Road, the IMAX screen would have been called the overstorey. And like any forest so very much was going on up there, which either complemented the music or the music complemented, that the sensory input was overwhelming in an either-or ‘concentrate-on-the-music-or-focus-on-the-images’ way. Yorkston/Thorne/Khan is one of the most inspired and inspirational cross-cultural acts to emerge this decade. They comprise the Scots musician and singer-songmaker James Yorkston, the double-bassist Jon Thorne, and the New Delhi-based, eighth-generation musician Suhail Yusuf Khan. All sing. Done right, their melding of, in order, Scottish and British folk music, jazz and electro, and sarangi lore, Hindustani classical and Sufi devotional music sings of a powerful musical alchemy. And they really do do it right as their choice and unique combination of Ivor Cutler to Bulleh Shah showed. While an abstract ‘mandala design’ spun above them, the opening instrumental ‘overture’ introduced the trio’s tonal palette. Its range has double-bass (Jon Thorne) in the earthy low registers, guitar and “cheating sarangi” nyckelharpa (James Yorkston) in the mid range and, way up where birds sing in the canopy, sarangi (Suhail Yusuf Khan). During Yorkston’s ‘The Blues You Sang’ the sky above animated Jad Fair’s static ‘silhouette’ artwork from Neuk Wight Delhi All-Stars(2017) with blinking eyes and body sways. (Elsewhere revolving images from Bimla Dutt’s The Ten Incarnations of Lord Vishnu also figured.) One piece from the album they had been in the studio recording during that very week shone out. Yorkston announced it, after explaining how he and Khan had first clicked backstage at a Scottish festival, playing ‘Lowlands Away’ – an English traditional song the Nottingham folksinger Anne Briggs transported to other realms on her debut EP The Hazards of Love (1964). The piece that shone out, he called ‘Now Westlin Winds’ (after Robert Burns). They had rush-premiered an unfledged version of it (though he didn’t explain) at Germany’s Rudolstadt Festival in July 2017. Now fledged, it flew. A composite piece, it dovetails a text attributed to Hazrat Amir Khusrau and set in the spring raga Bahar and Purbi (or Hinduvi) dialect and the utterly subversive “Slaught’ring Guns…” verse in the spirit of Burns’ original ‘Now Westlin Winds, [STET comma](And Slaught’ring Guns)’. From local flora to avifauna, what they have is an ecological testimony for then, now and always. Their visuals were merely the starters for Talvin Singh’s main course. The overstorey for his Illuminating India suite was the exhibition Illuminating India: Photography 1857–2017. Cleverly, his opus played on a tarang (wave) of tablas while deploying stored sound on his Apple Mac. Cleverly too, because above him technology wheeled. It spun through albumen photographic print and gelatine silver print images, swept through ‘don’t-move’ sepia, hand coloured and Kodachrome stills to grainy moving images and Technicolor. 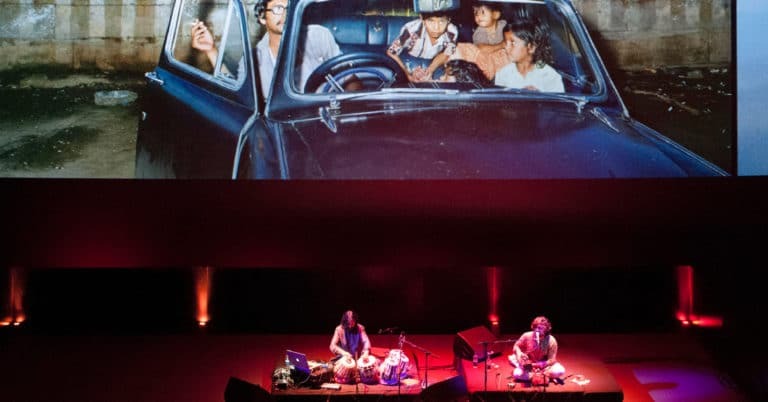 His music and soundtrack of chimes, degraded and distressed sound, and samples accompanied moving images of tabla- and sarangi-wallahs standing with their instruments slung in harnesses from their necks like Raj-era postcards come to life. There were lots of elephants, a pair of colonial-era sahib and maharaja galoots – each with one foot on a trophy tiger, of which there was a ‘brace’ as if tigers were grouse – and many montane scenes which over the opus figuratively bled through royal courts and cityscapes into industrial ‘landscapes’. There were images of mandir, mosque, Jain temple, bullock carts and cars. There were blendings into Independence and Partition (one of the ‘chapter’ headings) with Gandhi, Nehru, Jinnah and Mountbatten (but no Ambedkar). And, all the while, Singh – with a little help from Suhail Yusuf Khan for two chapters – spun a form of coagulated magic and multidimensional truth quite impossible to describe in print. In September 2015 the rudra veena player Ustad Bahauddin Dagar gave an extraordinary recital in the V&A Museum on the other side of Exhibition Road. Very, very occasionally an evening comes along with enough energy to break through terra firma’s gravitational pull. Illuminating India did. Both halves benefited considerably from, and exploited the venue’s one-off possibilities. Thanks to the Bagri Foundation, I have never experienced the like and probably never shall again. What a Night in a Museum!